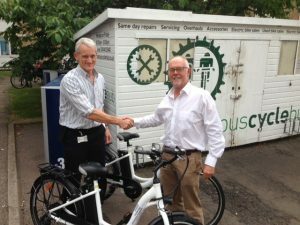 Cambridge University Hospitals' (CUH) staff: you can borrow an electric bike for business travel in the Cambridge area from the Campus Cycle Hub. Last year CUH staff completed 2,807 local business trips of less than 10 miles from the campus. CUH want as many of these journeys as possible to use these electric-bikes! Fully charged, your electric bike gives you a range of 25+ miles. So the e-bike is ideal for meetings within a 10-mile range. Even if your battery runs slightly low, remember there are six gears, so you can relatively easily pedal back to base. 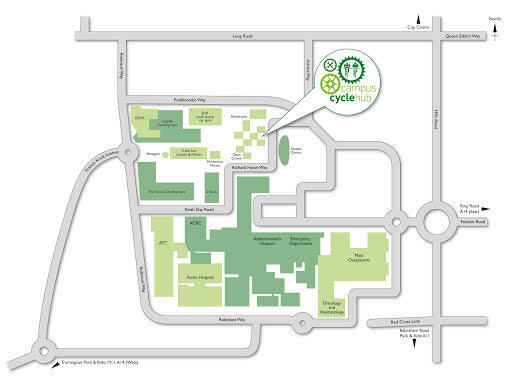 Complete this form & show your staff card at the Campus Cycle Hub, Richard Howe Way. The Campus Cycle Hub operates this e-bike pool bike service. It is just for Cambridge University Hospitals' staff. 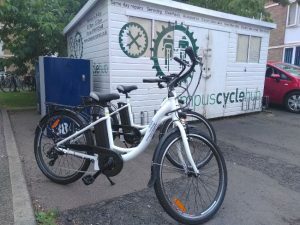 You can collect and return the electric bike to the cycle Hub any time during working hours (8am - 5pm). Just show your staff card and describe your trip in the Trip Record Book. You can arrange to collect or return the electric bike out of hours using the secure key safe on the Hub wall. However, you need to arrange this in advance, during working hours.